Click here to view images from Communion at Washington State Magazine. 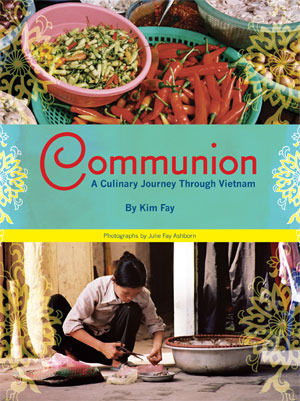 Featuring more than fifty photographs from a five-week culinary journey through Vietnam, Communion is more than just a food memoir or cookbook. With dynamic full-color pictures, it captures the spirit of the country through its food. Shot solely on film, this book uses a documentary-style and an emphasis on composition to capture the mood of the moment. Very few shots are staged in an effort to reflect the natural environment rather than the stylized version of Vietnam often portrayed in travel magazines. Living in Vietnam for four years in the 1990s, Seattle native Kim Fay fell in love with the romantic landscapes, the rich culture, and the uninhibited warmth of the people. A decade later, she grew hungry for more. Inspired by the dream of learning to make a Vietnamese meal for her friends and family in America, Kim returned to Vietnam and embarked on an unforgettable five-week culinary journey from Hanoi to Saigon. Joined by her sister—food photographer Julie Fay Ashborn—and their close Vietnamese friend, Kim set off to taste as much as possible while exploring rituals and traditions, street cafés and haute cuisine, famine and feast, and Communism and the legacy of war. Together, the three women discovered a society shaped by its ever-changing relationship with food. Every encounter serves up an enticing morsel, from uncovering the secret world of ragu in the French hill town of Dalat to bonding with the Julia Child of Vietnam in Saigon. Epicures and culture buffs will delight in markets, restaurants, farms, fisheries, and cooking classes as the trio assemble a dream meal and share recipes such as banana flower salad and clay pot fish. Examining how we eat reflects who we are as individuals and as communities, Communion: A Culinary Journey Through Vietnam offers a feast for armchair gourmets, as well as a colorful guide for travelers hungering for their next adventure. It’s Cocktails & Desserts This Oscar Party! Bomb’s Away! Ollie Turns Six.